Has it already been two weeks since the last day of #UNHLit15? Unbelievable. Time is flying by, as it always does in the sweet summertime. As I get older, I find myself wanting time to slow down…and that’s one of the perks of a writer’s notebook–it slows down a writer’s thinking. At right is a note I jotted to myself during Tom Newkirk’s class two short weeks ago. I’d been pondering the notion of length in my instruction–reading longer texts, writing longer pieces, sustaining an idea or a reflection for a longer period. While brainstorming ways to do that, I realized notebooks were one way to add length to the thinking process. They slow down a writer’s thinking, making it keep pace with the measured movement of a hand across a page, which is slower than the tapping of keys across a keyboard. As Tom Newkirk writes in his credo, “I believe that slow reading runs counter to a media culture that stresses speed, distraction, and a loss of history.” I believe the same thing of slow writing, in notebook form–it draws out thought in a way digital writing just can’t. Notebooks also make thinking visual. There is something about switching colors when revising, drawing lines to connect a tangled web of thoughts, or adding ideas to a pre-existing idea to show tangible growth that just can’t be done with a computer, voice recording, or video. 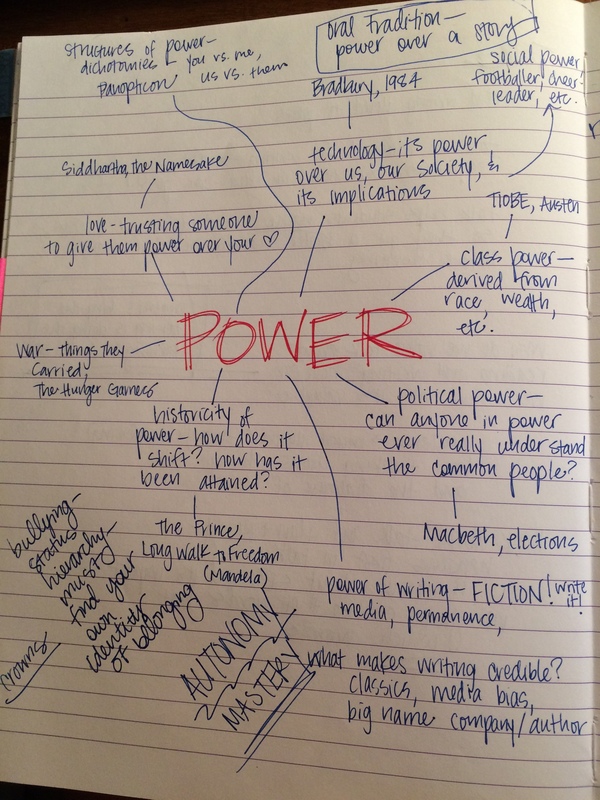 As I’ve pondered the theme of power–the overarching theme of my English 12 curriculum for this upcoming year–I’ve returned again and again to this page at my right, adding ideas, jotting inspirations, and connecting them to one another. I’ve loved watching the page become more and more crowded, my thoughts finally spilling over onto the facing page before making it into my typed syllabus and curriculum map. This visual map of my thinking is the most important part of my writing process, and without it, the typed pages I hand my students would lack coherence, focus, and quality. Finally, notebooks illustrate volume in a way typed papers or blog posts just can’t. Revisiting my old notebooks provides me a tangible location to mine ideas from–I can flip back to the summer of 2013 and find wild scrawls from my first class with Penny Kittle, or the fall of 2006 to see a plethora of hearts marking my budding courtship with my husband, or the spring of 2009 when I was frantically finishing my Masters thesis, evidenced by frantic scribbling and much crossing-out of ideas. All of this evidence of my thinking takes up an entire bookshelf in my office, showing me proof that my thinking has evolved over time. I want my students to feel that same sense of wonder and growth when they fill their second notebook by the end of our school year together. Notebooks are a map, a timeline, a guide–to our lives, our minds, and our hearts. They create a space for creative contagious concentration that is tangible and necessary, and which transcends the nebulous nature of digital writing. A notebook is accessible no matter where you are — you don’t need batteries or chargers or anything. I call my notebook and pens my portable word processor. I use sketching and drawing and full out paintings to express what can’t be said or just to pay homage to something that strikes me as lovely. Slowing down is an increasingly important thing to teach. I would love to hear more about your 12th grade curriculum around power. I’m teaching 12th grade for the first time this year (after teaching 6, 7, and 9) – I already started school but would love more ideas. Great article and the perfect short, sweet writing motivation for me today! Thank you! Following! 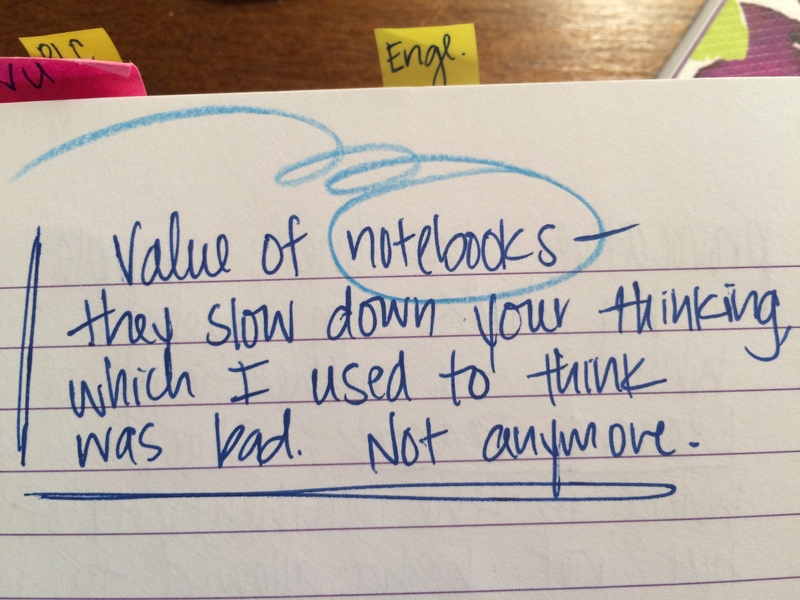 Kids need to experience the linguistic/ kinesthetic/intrapersonal connection of notebook musings. How would you recommend introducing the use of notebooks to high school English teachers for maximum buy-in? Change is often initially met with resistance, and first impressions carry great weight. On a side note: This Texas girl got to see Penny Kittle in May, and she is amazing!!! I feel lucky every time I see Penny too!! 🙂 I think lots of teachers are swung by the routine and structure notebooks provide, all without having to make a trip to the copy room. They also help provide space for volume of writing–Kelly Gallagher says we should have students writing four times as much as we can grade. Much of that writing goes in my students’ writer’s notebooks. Additionally, I think most English teachers take lots of notes and keep their own notebooks–don’t we want that same authentic practice happening in our students? I love notebooks and writing by hand. And my readings and knowledge of the history of Marginalia also help me to appreciate the way in which I interact with text, my own writings and that of others. I’ve noticed, though too, that my note taking has evolved and changed as a result of my digital communications, particularly since I started using excel so heavily. Invisible rows and columns inform the flow, the order, of my scribbles and writing while I feel a freedom using the space on a page, be it lined, graphed or blank, in handwriting in notebooks that I don’t have in digital writing. It is that sense of freedom which also fuels my creativity inasmuch as the visual composition becomes party of the communication. The shape and form of a piece of writing, the notes and edits in the margins, above, below and around, all become one unified form and expression. There is much to be said for notebooks/sketchbooks and writing or even doodling, because it is by hand, and the hand eye activity increases cognition, while this and even making lists also improves memory. I am very glad you put this up Amy. So many good points in favor of the tangible hand made document.